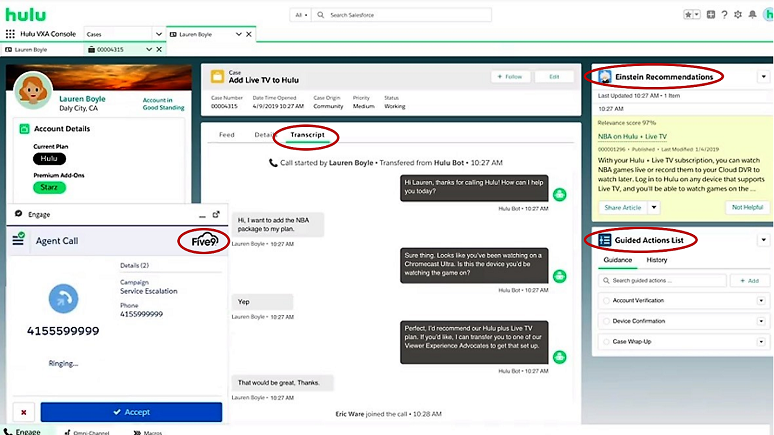 As detailed in a blog published today in conjunction with Google Cloud Next ’19 in San Francisco, Google Cloud is excited “to deliver the contact center of the future.” While that may seem a lofty claim, the dream team the company assembled to demonstrate a use case for streaming service Hulu includes not only Google Cloud and Salesforce but also a contact center-as-a-service (CCaaS) market leader, Five9. Google Cloud kicked off a flurry of excitement last summer with its contact center and artificial intelligence (AI) announcements and partnerships, as covered in No Jitter posts such as “Google Enters the Contact Center AI Fray” and “Google Embraces the Contact Center.” Nine months later, we’re seeing several additional announcements related to Contact Center AI. The biggest is certainly the integration of Google Contact Center AI with Salesforce Service Cloud, announced today. In conversations I’ve had with Adam Champy, Google Cloud’s Cloud Interactive AI product lead, I learned that one of the challenges the company found in bringing Contact Center AI to market was the need to work with each CCaaS vendor to build a unique integration to its agent desktop. That’s where Salesforce comes in. Salesforce has a commanding customer relationship management (CRM) market share, and there’s an increasing tendency for companies to have agents use the CRM desktop as their primary application. By delivering an integration between Contact Center AI and the Salesforce desktop APIs -- Salesforce CTI and Lightning CTI -- millions of agent desktops can be quickly enabled to deliver Google Cloud’s AI capabilities. Live agent assistance is where Five9 becomes part of the story. Five9 pipes the audio into Contact Center AI, explained Jonathan Rosenberg, Five CTO and head of AI, in an interview. The speech is analyzed, AI and analytics are applied, and knowledge base articles and transcripts are fed from Google Cloud into Salesforce and ultimately rendered into the Salesforce desktop. At Enterprise Connect last month and in other venues, both Rosenberg and Five9 CEO Rowan Trollope have been highlighting AI as an important part of future innovation at the company. Rosenberg pointed out, however, that this is only the beginning for Five9 with AI. "We're very excited about the three-way collaboration between Five9, Google, and Salesforce shown at Google Next,” he said. “We believe this to be an industry first -- real-time transcription and knowledge base suggestions using Google's AI against a voice call integrated into a CRM. This adds tremendous value to joint Five9 and Salesforce customers, and is the first step of an exciting journey around assistant technology!" Note that the initial customer use case, Hulu, is an existing joint Salesforce and Five9 customer. The same API between Google and Salesforce will be available to other CCaaS players so that their customers that use Salesforce can take advantage of the live agent capabilities described above. Note also that Google Cloud’s Champy said the company is open to discussions with other CRM vendors -- stay tuned. Hulu is taking advantage of both the chatbot and live agent versions in the pilot discussed at Google Next. How these capabilities would come together on the Salesforce agent desktop can be seen in the screenshot here. Dialogflow and Google Cloud Speech-to-Text are generally available today, a number of customers are already using these components, Champy reported. Agent Assist and the Contact Center AI APIs that handle session management are in beta.